..... Click the link for more information. within a protein coat. Most viruses are too small (100–2,000 Angstrom units) to be seen with the light microscope and thus must be studied by electron microscopes. In one stage of their life cycle, in which they are free and infectious, virus particles do not carry out the functions of living cells, such as respiration and growth; in the other stage, however, viruses enter living plant, animal, or bacterial cells and make use of the host cell's chemical energy and its protein- and nucleic acid–synthesizing ability to replicate themselves. highly contagious disease almost exclusive to cattle, sheep, swine, goats, and other cloven-hoofed animals. It is caused by a virus, specifically an aphthovirus, that was identified in 1897. 1904–71, American biochemist, b. Ridgeville, Ind., Ph.D. Univ. of Illinois, 1929. He was a professor at the Rockefeller Institute for Medical Research (now Rockefeller Univ.) from 1932 to 1948 and at the Univ. ..... Click the link for more information. crystallized tobacco mosaic virus; for that work Stanley shared the 1946 Nobel Prize in Chemistry. Later studies of virus crystals established that the crystals were composed of individual virus particles, or virions. By the early 21st cent. the understanding of viruses had grown to the point where scientists synthesized (2002) a strain of poliovirus using their knowledge of that virus's genetic code and chemical components required. ..... Click the link for more information. . Certain viruses, such as bacteriophages, have complex protein tails. The inner viral genetic material—the nucleic acid—may be double stranded, with two complementary strands, or single stranded; it may be deoxyribonucleic acid (DNA) or ribonucleic acid (RNA). The nucleic acid specifies information for the synthesis of from a few to 50 different proteins, depending on the type of virus. ..... Click the link for more information. ) in which the virus has been engulfed. Within the cell the virus nucleic acid uses the host machinery to make copies of the viral nucleic acid as well as enzymes needed by the virus and coats and enveloping proteins, the coat proteins of the virus. The details of the process by which the information in viral nucleic acid is expressed and the sites in the cell where the virus locates vary according to the type of nucleic acid the virus contains and other viral features. As viral components are formed within a host cell, virions are created by a self-assembly process; that is, capsomere subunits spontaneously assemble into a protein coat around the nucleic core. Release of virus particles from the host may occur by lysis of the host cell, as in bacteria, or by budding from the host cell's surface that provides the envelope of membrane-enveloped forms. , unit of genetic material composed of a series of genes that sometimes has an independent existence in a host cell and at other times is integrated into a chromosome of the cell, replicating itself along with the chromosome. Episomes have been studied in bacteria. process of "shuffling" of genes by which new combinations can be generated. In recombination through sexual reproduction, the offspring's complete set of genes differs from that of either parent, being rather a combination of genes from both parents. (epidemic parotitis), acute contagious viral disease, manifesting itself chiefly in pain and swelling of the salivary glands, especially those at the angle of the jaw. Other symptoms are fever, a general feeling of illness, and pain on chewing or swallowing. acute, highly contagious disease causing a high fever and successive stages of severe skin eruptions. Occurring worldwide in epidemics, it killed up to 40% of those who contracted it and accounted for more deaths over time than any other infectious disease. acute infectious disease endemic in tropical Africa and many areas of South and Central America. Yellow fever is caused by a virus transmitted by the bite of the female Aedes aegypti mosquito, which breeds in stagnant water near human habitations. acute, highly contagious disease caused by a RNA virus (family Orthomyxoviridae); formerly known as the grippe. There are three types of the virus, designated A, B, and C, but only types A and B cause more serious contagious infections. any of several drugs used to treat viral infections. The drugs act by interfering with a virus's ability to enter a host cell and replicate itself with the host cell's DNA. ..... Click the link for more information. , which inhibits viral growth within the infected cell. Viruses are not usually classified into conventional taxonomic groups but are usually grouped according to such properties as size, the type of nucleic acid they contain, the structure of the capsid and the number of protein subunits in it, host species, and immunological characteristics. See C. Zimmer, A Planet of Viruses (2011). Any of a heterogeneous class of agents that share three characteristics: (1) They consist of a nucleic acid genome surrounded by a protective protein shell, which may itself be enclosed within an envelope that includes a membrane; (2) they multiply only inside living cells, and are absolutely dependent on the host cells' synthetic and energy-yielding apparatus; (3) the initial step in multiplication is the physical separation of the viral genome from its protective shell, a process known as uncoating, which differentiates viruses from all other obligatorily intracellular parasites. In essence, viruses are nucleic acid molecules, that is, genomes that can enter cells, replicate in them, and encode proteins capable of forming protective shells around them. Terms such as “organism” and “living” are not applicable to viruses. It is preferable to refer to them as functionally active or inactive rather than living or dead. Although viruses differ widely in shape and size (see illustration), they are constructed according to certain common principles. Basically, viruses consist of nucleic acid and protein. The nucleic acid is the genome which contains the information necessary for virus multiplication and survival, the protein is arranged around the genome in the form of a layer or shell that is termed the capsid, and the structure consisting of shell plus nucleic acid is the nucleocapsid. Some viruses are naked nucleocapsids. In others, the nucleocapsid is surrounded by a lipid bilayer to the outside of which “spikes” composed of glycoproteins are attached; this is termed the envelope. The complete virus particle is known as the virion, a term that denotes both intactness of structure and the property of infectiousness. Viral genomes encode three types of genetic information. First, they encode the structural proteins of virus particles. Second, most viruses encode enzymes capable of transcribing their genomes into messenger RNA molecules that are then translated by host-cell ribosomes, as well as nucleic acid polymerases capable of replicating their genomes; many viruses also encode nonstructural proteins with catalytic and other functions necessary for virus particle maturation and morphogenesis. Third, many viruses encode proteins that interact with components of host-cell defense mechanisms against invading infectious agents. The more successful these proteins are in neutralizing these defenses, the more virulent viruses are. Antiviral agents on which much interest is focused are the interferons. Interferons are cytokines or lymphokines that regulate cellular genes concerned with cell division and the functioning of the immune system. Their formation is strongly induced by virus infection; they provide the first line of defense against viral infections until antibodies begin to form. Interferons interfere with the multiplication of viruses by preventing the translation of early viral messenger RNAs. As a result, viral capsid proteins cannot be formed and no viral progeny results. A computer program that replicates itself and transfers itself to another computing system. 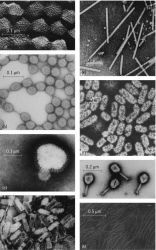 A large group of infectious agents ranging from 10 to 250 nanometers in diameter, composed of a protein sheath surrounding a nucleic acid core and capable of infecting all animals, plants, and bacteria; characterized by total dependence on living cells for reproduction and by lack of independent metabolism. (By analogy with biological viruses, via SF) A program or piece of code written by a cracker that "infects" one or more other programs by embedding a copy of itself in them, so that they become Trojan horses. When these programs are executed, the embedded virus is executed too, thus propagating the "infection". This normally happens invisibly to the user. By the 1990s, viruses had become a serious problem, especially among IBM PC and Macintosh users (the lack of security on these machines enables viruses to spread easily, even infecting the operating system). The production of special antivirus software has become an industry, and a number of exaggerated media reports have caused outbreaks of near hysteria among users. Many lusers tend to blame *everything* that doesn't work as they had expected on virus attacks. Accordingly, this sense of "virus" has passed into popular usage where it is often incorrectly used for a worm or Trojan horse. Software used to infect a computer. After the virus code is written, it is buried within an existing program. Once that program is executed, the virus code is activated and attaches copies of itself to other programs in the computer and other computers in the network. Infected programs continue to propagate the virus, which is how it spreads. The effect of the virus may be a simple prank that pops up a message on screen out of the blue, or it may destroy programs and data right away or on a certain date. For example, the famous Michelangelo virus contaminated the machine on Michelangelo's birthday. A virus is a self-contained program that attaches itself to an existing application in a manner that causes it to be executed when the application is run. Macro viruses are similar. The virus code has replaced some or all of the macro commands. Likewise, it is in the execution of the macro that the damage is done (see macro language). The term "computer virus" was coined in the early 1980s, supposedly after a graduate student presented the concept of a program that could "infect" other programs. Since then, more than a million viruses have been defined. However, the bulk of the infections are from only a few hundred active variants, said to be "in the wild." Since 1993, the WildList Organization has been keeping track of virus attacks around the world. For more information, visit www.wildlist.org. For a sampling of different virus infections, see virus examples. See in the wild, dangerous extensions, quarantine, disinfect, macro virus, email virus, behavior detection, polymorphic virus, stealth virus, worm, boot virus, vandal, virus hoaxes and crypto rage. John von Neumann theorized that a computer program could replicate itself in his 1949 paper "Theory and Organization of Complicated Automata," and computer scientist Fred Cohen described the logic for several types of viruses in his 1984 paper "Computer Viruses - Theory and Experiments." See von Neumann architecture. Almost all Windows users install an antivirus program in their computers, while many Mac users do not. Windows computers are attacked constantly, because they make up the huge majority of personal computers and are therefore the low-hanging fruit. In addition, the Mac is a Unix-based machine, and the Unix architecture separates the operating system from the applications, which makes it harder to crack, although not impossible. While the majority of Mac users do not use antivirus software, there have indeed been successful virus attacks against Macs, and Mac users are installing antivirus more than they have in the past. See antivirus program. The concept of a computer "disease" seemed rather foreign in 1989 when this caption from the definition for virus in "The Computer Glossary" was published. Back then, nobody would have believed that millions of viruses were to follow. About the Author Edited by Alan Cann, Department of Microbiology and Immunology, University of Leicester Content Outline: List of protocols page Abbreviations 1 Investigation of RNA virus genome structure A. Last year Palese and his colleagues created the first gene-altered influenza virus, a single-stranded RNA virus. Influenza, commonly known as the flu, is an infectious disease that infects birds and mammals (primarily of the upper airways and lungs in mammals) and is caused by an RNA virus. Initially, the disease was referred to as "mystery swine disease" until its cause was determined to be a positive-stranded RNA virus, designated porcine reproductive and respiratory syndrome virus (PRRSV), that together with murine lactate dehydrogenase-elevating virus (LDV), equine arteritis virus, and simian hemorrhagic fever virus, belongs to the family Arteriviridae (6). Engineering the largest RNA virus genome as an infectious bacterial artificial chromosome.